Summer is my favorite season for so many reasons but I can’t get enough of the fresh produce! 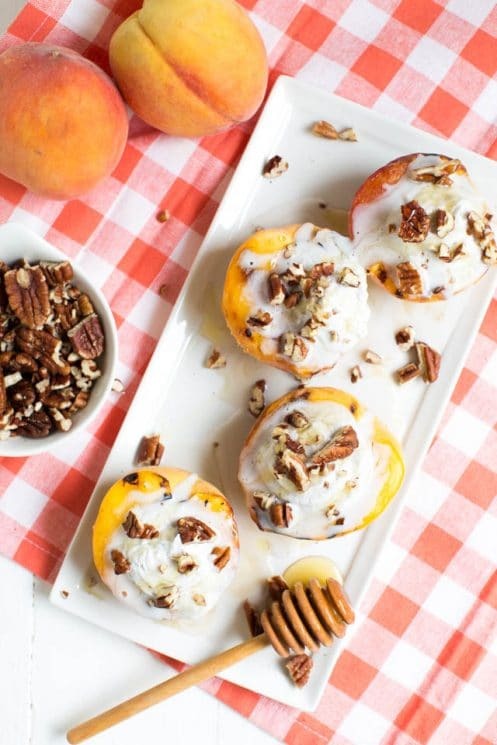 Peaches are the best when they are in season and we are right in the middle of peach season. 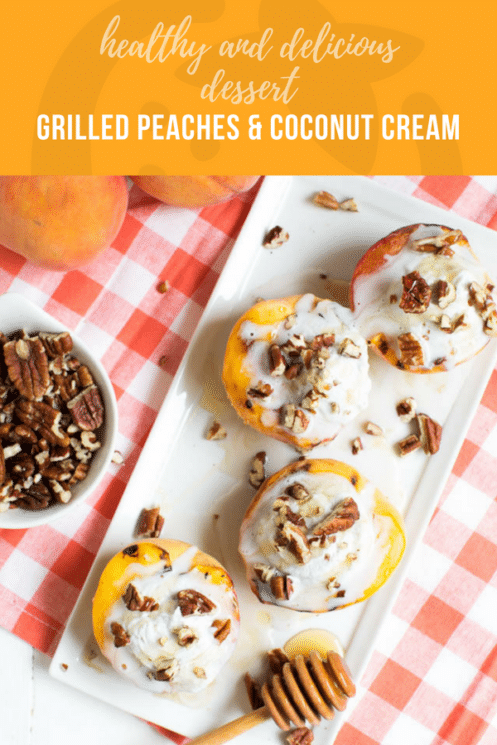 Today, I’m sharing this grilled peaches and coconut cream recipe with you. The dessert is made with only five ingredients and comes together in little time. Grilled peaches and cream is a family favorite. Rather than using standard whipped cream or ice cream, this recipe uses whipped coconut cream. The coconut cream adds the perfect amount of flavor and is a great dairy free option. 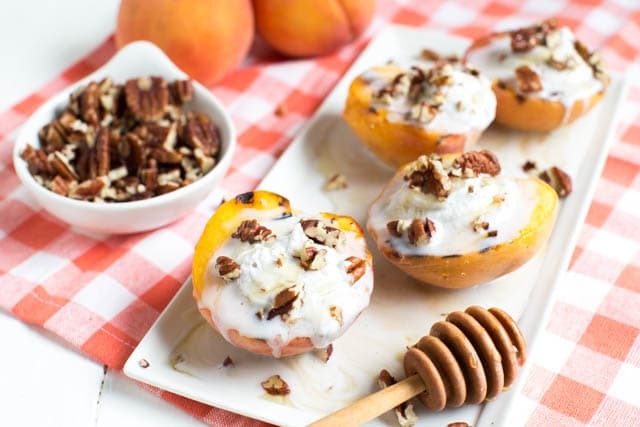 The peaches and cream are topped with chopped pecans and a little drizzle of honey. You can use your favorite crunchy nut and can even omit the honey, if desired. 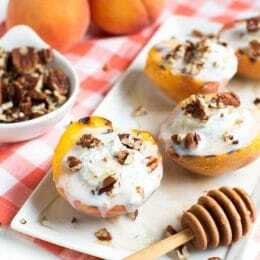 The combination of peaches, coconut, honey and crunchy pecans creates a dessert filled with sweet flavor. Fire up your grill, make a fresh and healthy dinner and enjoy a sweet treat for dessert! You can even save time by preparing the whipped coconut cream ahead of time. Store it in the refrigerator until you are ready to use, up to one or two days in advance. 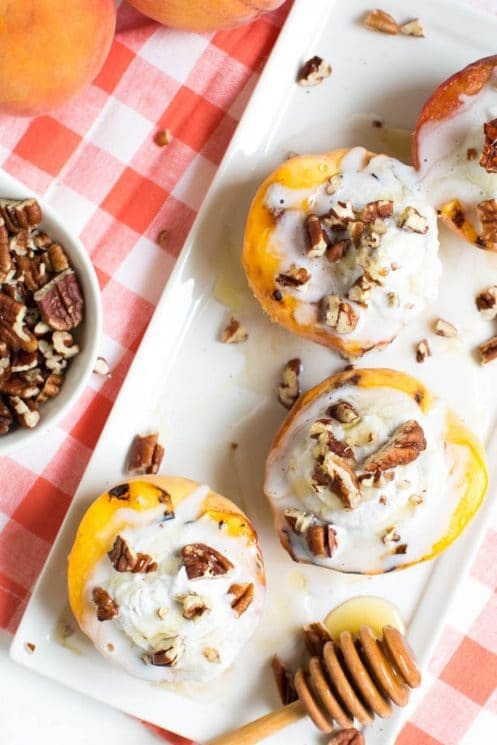 Top the peaches with whipped coconut cream and create a delicious grilled peach dessert with a melty cream topping. If you are looking for more tasty recipes made with fresh peaches, try a Peach Pie Smoothie bowl. Enjoy the best flavors of the season and make your own tasty peach creations at home! Ashley shares more of her favorite easy yet impressive recipes, including healthy meal plans and more, on Spoonful of Flavor. Go ahead, make this delectable dessert featuring grilled peaches and coconut cream. Enjoy the best flavors of the season! To make the whipped coconut cream, place the bowl of a stand mixer in the freezer for 5 to 10 minutes to chill. Remove the bowl from the freezer and scoop out the solid portion of the chilled coconut milk into the bowl. (You can reserve the liquid from the coconut milk and add to smoothies, if desired. Do not use the liquid for the whipped cream or else it won’t yield a fluffy texture.) Whisk on medium-high speed until light and fluffy. Add 2 teaspoons honey and the vanilla extract. Whisk until well blended. Preheat grill to medium heat. 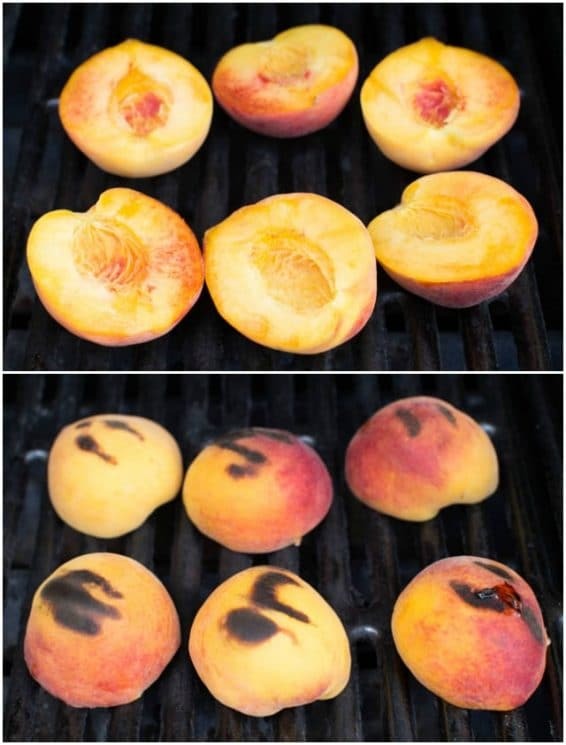 Grill peaches until tender, about 3 minutes on each side. Remove from the grill and cool slightly. Arrange the peaches on a plate. Top with whipped coconut cream, chopped pecans and a drizzle of the remaining honey, as desired. Serve immediately. *Note: You can omit the honey or use your favorite sugar substitute in the coconut cream.